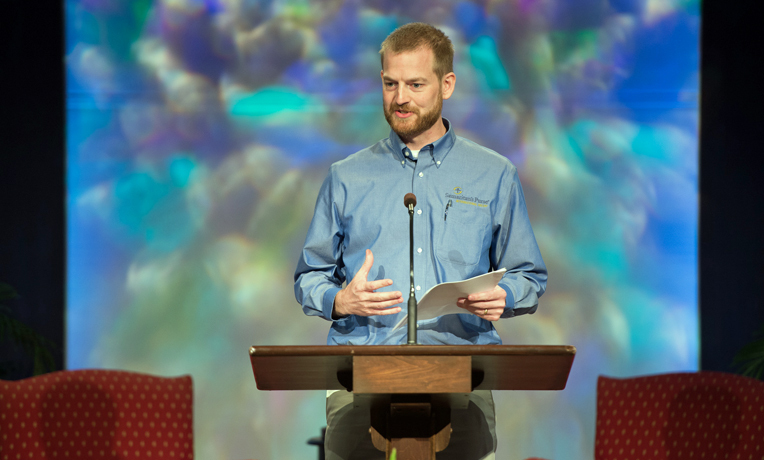 Ebola survivor Dr. Kent Brantly shared his testimony with over 300 people attending the Samaritan’s Purse Prescription for Renewal medical conference at the Billy Graham Training Center in Asheville, North Carolina, on October 11. Coordinated by World Medical Mission, the medical arm of Samaritan’s Purse, Prescription for Renewal is a conference for Christian doctors, dentists, nurses, and their spouses. Since 1977, World Medical Mission has helped thousands of physicians serve on short-term assignments in mission hospitals and clinics around the world. Dr. Brantly thanked the Lord for his survival. Dr. Brantly contracted Ebola while he was serving as a medical missionary at ELWA Hospital in Liberia through the Samaritan’s Purse Post-Residency Program, coordinated through World Medical Mission. When Dr. Brantly told his wife, Amber, and his parents that he had contracted Ebola, he said God blessed him with a special sense of His presence. The Ebola outbreak was brought to the world’s attention in July when Dr. Brantly was airlifted from Liberia to Emory University Hospital in Atlanta, Georgia, to receive treatment for the deadly disease. More than 4,000 people have died as a result the Ebola outbreak that is sweeping across West Africa, primarily in the three neighboring countries of Liberia, Guinea, and Sierra Leone. Since his recovery, Dr. Brantly has been rallying support for an international medical response to treat Ebola victims and implement a massive awareness and prevention campaign in West Africa. He has testified before Congressional committees concerning Ebola and met with President Barack Obama at the White House. Wherever Dr. Brantly shares his story, he uses every opportunity to point people to Christ. “I just want God to be glorified,” he said. The Brantlys are currently living in Texas, giving Kent time to fully regain his strength as they pray as a family for God’s direction.